The Sam Fisher you knew is dead. His country betrayed him when it asked him to go one step too far; his agency betrayed him when it asked him to kill his best friend; and the world betrayed him when his daughter was taken from him one anonymous night. 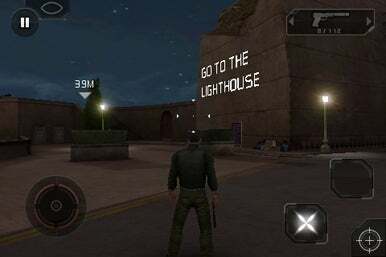 Gameloft's Splinter Cell: Conviction follows Sam Fisher, ex-Third Echelon agent and killing machine, who’s just heard whispers of a chilling rumor: his daughter’s death was not a drunken mistake, after all. The rumors lead him to the Mediterranean island of Malta, where he will use his Third Echelon skills to defeat numerous enemies over 11 levels set in eight different locations. Splinter Cell: Conviction is more about using stealth to take out your enemies than it is about raw power (although, you’ll quickly learn that Fisher is damn near invincible when it comes to killing with his bare hands). There are a few major stealth moves that will assist you in getting out alive. First, there’s what’s known as your “last known position”—when Fisher shoots or otherwise gives away his position and then slides behind a crate, a white outline shows up as his “last known position.” The enemy will think Fisher is at this position, and so Fisher can sneak up and execute a kill. Another stealth move is known as the “mark and execute” feature. When Fisher is sneaking through a window or a door, he can first mark specific enemies (or objects, such as lights) and then shoot them all at once with a single press of the action button once he bursts through the door. This is particularly nice on the iPhone, as the aiming otherwise takes a lot of getting used to. Splinter Cell: Conviction is at its very best when you’re using stealth moves to map out a plan that involves taking out six enemies before they’ve even seen you. It’s when things can’t be perfectly planned out—for example, there are more enemies than you can reasonably take out in one shot—that the game starts to suffer. Stealth moves are easily executed, but fast-paced, close-quarter fighting is frustrating with the controls. The mechanics are fairly basic—there’s a virtual d-pad for moving, a couple of action buttons (that change depending on the situation) in the bottom right corner, and a slider in the upper right corner for changing weapons. You can also tap and drag the screen to look around. The d-pad was responsive and easy to use—the “tap and drag to look” function, however, was a little frustrating to use in conjunction with the d-pad. It’s not really an issue when you’re standing still, but trying to run and look and aim and shoot at the same time is pretty much impossible. Luckily, there are not a lot of instances that call for such super-multi-tasking. A one-click button for centering your point of view would have been supremely helpful, however. The function buttons change, depending on the situation. The lower left button stays the shoot/attack button, but the upper right button changes. The upper right button can be anything from “climb” (if there’s a ladder in front of you) to “duck” (if there’s a crate/wall in front of you). Despite the confusing and frustrating controls, I found Splinter Cell: Conviction incredibly easy on every level but one. The artificial intelligence in this game is, um, not terribly intelligent—enemies hardly ever see Fisher when he’s in the dark (even if they’re walking on top of him), and when they do see him it still takes them several hits/shots to take him down. Meanwhile, Fisher can take out six enemies with his bare hands while being shot at (and hit) for several seconds. What Splinter Cell: Conviction lacks in controls, it makes up for in graphics—while the actual levels are more reminiscent of Nintendo 64 Bond games than they are of the Xbox version, the cut scenes are fantastic. The levels also offer interesting scenery—from the darkened waterside Maltese marketplaces to the Potomac river—and a lot of depth, though characters are somewhat blocky. The attractive, worded in-game objectives are a nice feature, and help the game to move along without breaking up the action. The blue and white checkpoints (instead of the compass that exists in the Xbox version) help to conserve screen real estate and still keep you on track. Splinter Cell: Conviction could have been amazing with some better controls—a one-click centering button and an auto-aim feature would probably put this game up there with the best of them. Unfortunately, the shoddy controls are holding it back—which is why I gave it 3.5 stars: not a must-have, but worth a look if it ever goes on sale.